Greenhouses are getting bigger. The distance between the grower and the crop increases. New technologies are being introduced to help and keep the overview. Acquiring more accurate data on crop growth and local growth conditions can provide the grower with better means to understand how and where problems in the crop are arising and, therefore, when, where and how to fix problems that threaten to hinder crop productivity. Unfortunately, current data acquisition techniques have limited spatial resolution and are labour intensive. This is where HiPerGreen comes into the picture! The Netherlands is the second largest exporter of agricultural/horticultural goods in the world and the industry accounts for 9% of the Dutch Gross Domestic Product (GDP) (LEI Wageningen UR, 2014). With billions of euros at stake, businesses in the industry want to ensure their crops are grown in optimal conditions and waste levels are kept to a minimum. The project results will be disseminated especially among SMEs, in lectures, publications and symposiums. At Inholland, students and teachers participate in various educational activities: vakopdrachten, projects, internships and graduation projects. Aeronautical engineering students have received a lot of grants to develop drone use in greenhouses. Last Friday October 27 the two year project HiPerGreen (High Precision Greenhouse Farming) kicked off at Inholland University of Applied Sciences in Delft. It is a restart of a project that four students had begun two years ago: Lucien Fesselet from France, Bram Sanders from the Netherlands, Chris Ramsay and Will Simmonds from the UK. 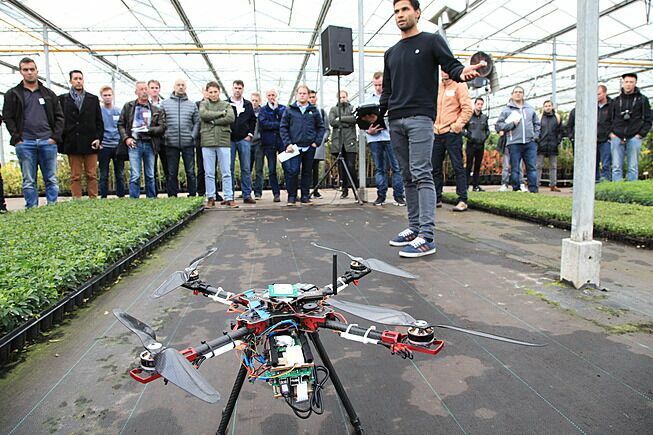 They developed a drone for use in greenhouses and tested it for crop monitoring in a few Dutch ornamental nurseries, including Bunnik Plants. They also demonstrated their drone at several events, like last year a drone conference for nurseries organized by Hortipoint, publisher of this website. This first project was so successful that the students set up their own company, Applied Drone Innovations, to continue their development for practice. They tried to obtain funding, which failed a few times. However, recently they managed to win funding from the Netherlands Organisation for Scientific Research: nearly €300,000 for the university project in cooperation with small and medium-sized businesses. The total budget is €600.000; the other half is from Inholland and project partners. Several institutes and companies are now involved in the project. The aim is to develop a drone system that can measure crop yields and quality, autonomous and with a high accuracy. Benefits for the nursery will be a better quality and better pest management.